With Britain’s agriculture sector watching Brexit closely following the triggering of Article 50, the UK also announced a snap General Election due to take place on the 8 June. The sector will be closely monitoring each parties manifesto to determine which is best for agriculture moving forward. 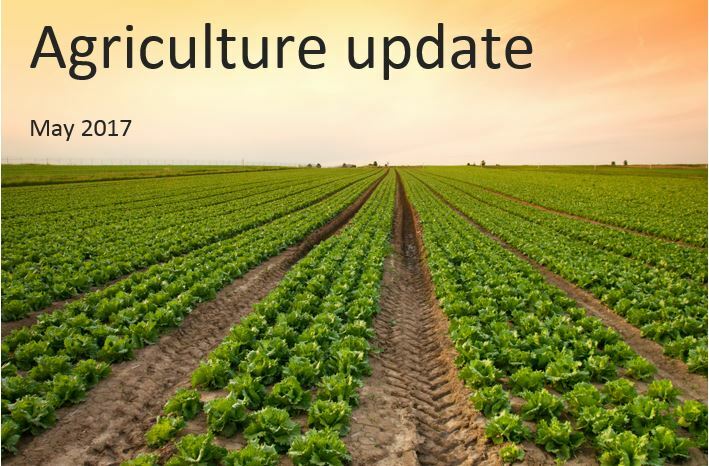 In this article, we’ll be looking at what May has meant for agriculture in this agriculture update UK farmers. Average monthly rainfall in April was 7.6mm compared to 66.8mm in April 2016 – making it the driest period since 1995. Farmers are being forced to irrigate to maintain yields. On a more positive note, Defra figures show that Total Income From Farming (TIFF) rose 1.5% or £59 million in real terms to £3.9 billion in 2016. However, the total output fell by 3.% to £23.5 billion mainly because of falls in volume and prices for cereals and milk. TIFF rose mainly because of lower input costs. Famers Weekly has reported that land prices are continuing to fall. They quote Knight Frank’s Farmland Index first quarter 2017 average value of bare farmland fell 0.5% to £7,435 per acre. This is the smallest quarterly drop and is less dramatic than the 8.5% fall recorded by the agent’s index last year. The same article quotes the supply of farmland across Britain in Q1 was 38% down on the long term average and 42% down on the same quarter last year, with only 11,000 acres marketed. However, it should be noted that the market is generally weak in the first quarter and commentators do expect it to pick up later in the year. Moving on from the General Election, rain in the last few weeks has eased fears of a UK drought this summer and the CLA (Country Land and Business Association) has launched a campaign for the next Government to deliver a Brexit that works for farmers. Farm borrowing rose in the first quarter of 2017 by £384m despite the 18% boost to BPS payments as a result of the decline of sterling. Many inputs are costing more because of sterling’s weaknesses. Finally, tractor sales in the first four months of 2017 are 20% higher than in 2016.